Day five of our trip began with us leaving our hotel before sunrise for a domestic flight from Tokyo Haneda to Memanbetsu in the north-eastern corner of Hokkaido. Our online boarding passes had language indicating that we should clear security no later than fifteen minutes before departure, and based on that we decided to get to the airport an hour early, which we assumed would give us enough slack to complete formalities without feeling rushed. This turned out to be far in excess of what we needed, but on the positive side we had thirty minutes to enjoy a relaxed breakfast before boarding began. The ninety minute flight, operated by a completely full 767, was an absolute joy for two tourists used to European short haul travel; it had completely free high speed internet (from five minutes after takeoff until five minutes before landing), a complimentary drinks service, and absolutely no irritating announcements about this month's duty free selections. We landed on time and less than thirty minutes later were on the road in our rental car. During the eighties the Japanese manufacturer Togo produced a series of wild mouse roller coasters. Most versions were along the lines of those offered by western manufacturers, but a total of three were upgraded with inversions. The first example of the genre opened at Tobu Zoo Park in 1981, followed in short order by another at Nakajima Park and a third at Maruyama KidLand. The model line disappeared soon after that, though the platform was resurrected briefly in 1997 with the ill-fated Windjammer Surf Racers at Knott's Berry Farm, a racing coaster that closed permanently after just three years due to repeated mechanical problems. Crazy Mouse (#2368) is the second version of the design, having been relocated to Kitami Family Park at the turn of the millennium following the closure of Nakajima Park in nearby Sapporo. The ride fits remarkably well into its new home, with the only clue to its second-hand nature being a series of tall concrete pillars underneath a few of the supports which were presumably simpler than landscaping to match the original terrain. The loop structure wears a bright red hue, but the rest of the hardware is in a subtle mix of green and blue that allows it to blend smoothly into the surrounding landscape. We made some quick checks to confirm that the ride was actually open, and having determined that it was we acquired unlimited wristbands and made our way to the queue. The station was unattended, but an operator had seen us heading that way and turned up moments later. He evidently realised that we knew what we were doing and let us close our own restraints before leaning over to make sure they were secure. Seconds later he headed into the control box and sent us on our way. The station exits directly onto the lift hill, a tight turnaround, and a vertical loop negotiated with remarkable finesse for a ride that is at least three decades old. This is followed by a climb out, a series of mouse turns, two banked curves, and my favourite section: a pair of gentle airtime hills that rise no more than a few feet off the ground. One final turn then brings the car to the brake run. I'd been expecting very little from the ride, given the experience on the equivalent at Maruyama KidLand, which might explain why I enjoyed it so much. The pacing was good, the tracking was smooth, and the layout was interesting, easily justifying the considerable effort we'd made to experience it. Over the course of our visit we completed four laps, and we'd happily have done more if our schedule had allowed it. The only thing we didn't get to do was sit in the back of a car for comparison purposes, though I rather suspect that I wouldn't have fit there anyway. Our second stop was at a powered coaster that from a distance could easily be confused with a standard Zamperla Dragon. Closer inspection however revealed Dragon Coaster to have some subtle differences in the track construction, not least a completely different design of power rail, and it was no huge surprise to find a label crediting it to Japanese manufacturer Saeki. 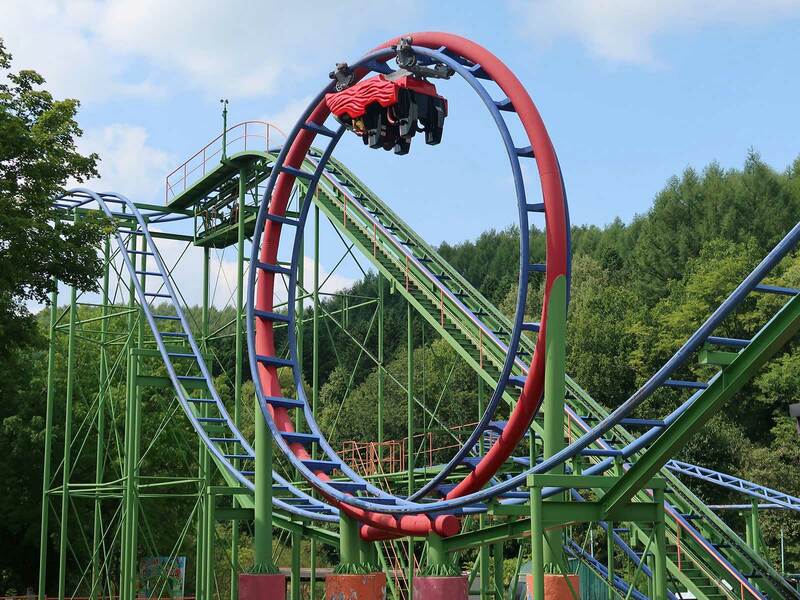 The ride, which began life at Maruyama KidLand, was considerably faster than the Zamperla originals, resulting in a brilliantly forceful descending helix that felt far more powerful than usual for the genre. Our exploration continued with a train that took us on a tour around the back of the park. There were no real photo opportunities from on board, but the routing allowed us to see that we'd do far better from an elevated cycle monorail, as indeed we did. We also tried the Space Shuttle, a locally built equivalent of the Flying Machines at Blackpool Pleasure Beach and Legendia, as well as a terrain slide stretching at least one hundred feet up the side of a nearby mountain. Sadly our adult weights were apparently too much for the grooved metal surface, as we kept getting stuck due to excess friction, but on the positive side the photo angles from the heights were unmatched. Those who count powered coasters may face a dilemma with the park's convoy ride, clearly designed for those aged five or less. We watched with considerable interest as the ten cars descended a helix at a speed that looked to be at least as fast (if not faster) than the drop on most Wacky Worms. The rear car in particular looked like a source of fun laterals, but no adult could ride without double amputation, thus restricting us to watching from the ground. I shot a video for posterity, reproduced below, and in so doing managed to completely wipe out my camera battery, much to my annoyance. If anyone from Canon is reading this, recording a video with a PowerShot camera shouldn't drain virtually an entire charge in less than a minute! Family Ailand You is a free admission park located along a beautiful stretch of coast in northern Hokkaido. There were no other guests in sight when we arrived and just two roving operators waiting to press the appropriate buttons on whatever attractions we chose. The earlier cloud had broken, leaving a beautifully sunny day, and we decided to make the most of it by riding the Giant Wheel, which gave a beautiful view of the ocean on one side and a superb overview of the park from the other. With that done we headed for the Dragon Coaster, a Senyo copy of the ubiquitous Zamperla Dragon with what looked to be retrofitted plastic covers designed to stop children putting their legs outside of the car. Though somewhat more sedate than the one earlier in the day this version was memorable for having reduced dimensions over the norm and thus tighter turns. We were given three laps, which was two more than we needed.